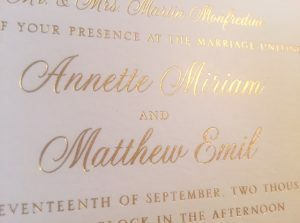 These simple, yet elegant wedding invitations from our William Arthur Designs are gold foil on Ecru stock. 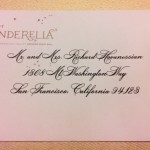 What makes these wedding invitations really different are the raspberry painted edges. The gold foil scripted font on top of the creamy ecru stock with the grapes motif, are just splendid for our couple’s Napa, California wedding. 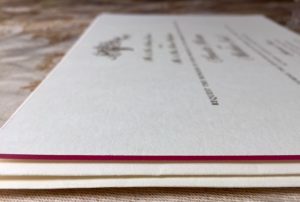 This exquisitely tick, heavy stock wedding invitation is luxurious with a touch of whimsy on the edges. The color of the edges can be personalized to fit the theme of the wedding. The gold foil grapes printed on the initation are the perfect effect tying the theme of the wedding which is a Napa wedding in California. The wedding invitation Response card is a matching gold foil with the icons of cow, fish and carrots for; meat, sea food or vegetarian entree choice for the guests. Our couple, Annette & Miriam, also have created a separate Silverado Mansion Card, and because it is a two day event, a Fiesta Card the day before the wedding. The above pre-wedding reception card for Matt & Annette is thermography printed with gold ink on cream stock. 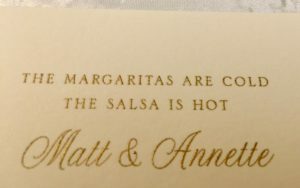 It reads, “THE MARGARITAS ARE COLD THE SALSA IS HOT”. 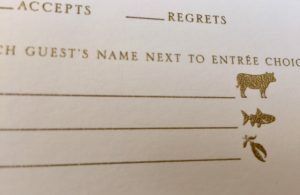 This is a great, fun way to invite the wedding guests to a pre wedding bash. It’s casual, laid back; a nice way for the guests to intermingle before the formal wedding ceremony. This beautiful card shines and changes with the light. It’s enchanting and makes you look forward to this Napa style wedding! The gold stamped grapes flutter on top of the Luxurious William Arthur Wedding Invitation designed by Hyegraph Invitations & Calligraphy. This wedding response card shows guests with the icon for cow, fish and carrots the entree choices for the wedding reception. Cow for beef, fish for seafood and carrots for vegetarian entree choice. 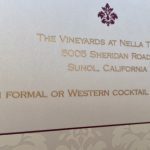 The Wedding Invitation Suite is quite stunning and fitting for A Napa, California Winery Wedding. Congratulations to our Hyegraph couple Annette & Matthew!